Real or fictional stories about boats and boating. Photography 101 Day 20 Today, let’s bump up the contrast for a bold take on triumph. Triumph usually denotes drama of some sort, no matter whether it’s big or small. Playing with contrast is a great way to enhance your photos for a more dramatic effect. Using outdated 19th century military strategy, Allied generals believed that sending wave after wave of infantry would eventually overwhelm the enemy. Soaring casualty rates proved that soldiers attacking with rifles and bayonets were no match for German machine guns. Each side dug in and soon the Western Front became a patchwork of trenches in France and Belgium stretching from Switzerland to the North Sea. In April 1917, Canadians helped turn the tide of battle when they won a major victory at Vimy Ridge. This triumph came at high cost: more than ten thousand casualties in six days. Even with this victory, the war continued for more than a year. Finally, on November 11, 1918, the Armistice was signed and the Canadians took part in the triumphant entry into Mons, Belgium. Throughout this conflict, Canadians proved that they could pull their weight, and by their effort earned for Canada a new place among the nations of the world. 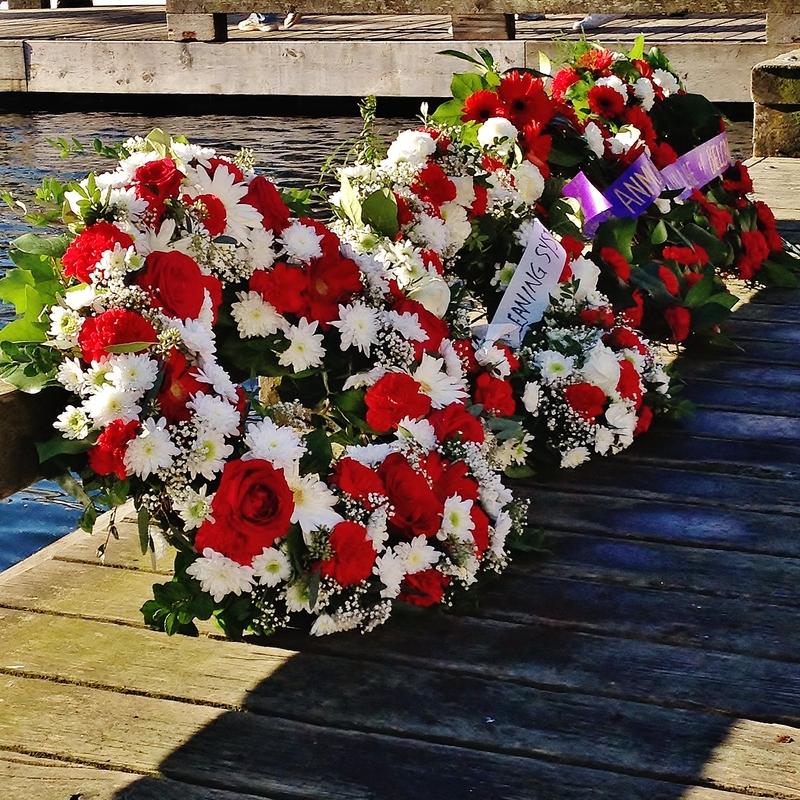 Every year on November 11th, our squadron puts on a very moving tribute at Belcarra Park dock to remember our veterans who fought for our freedom. 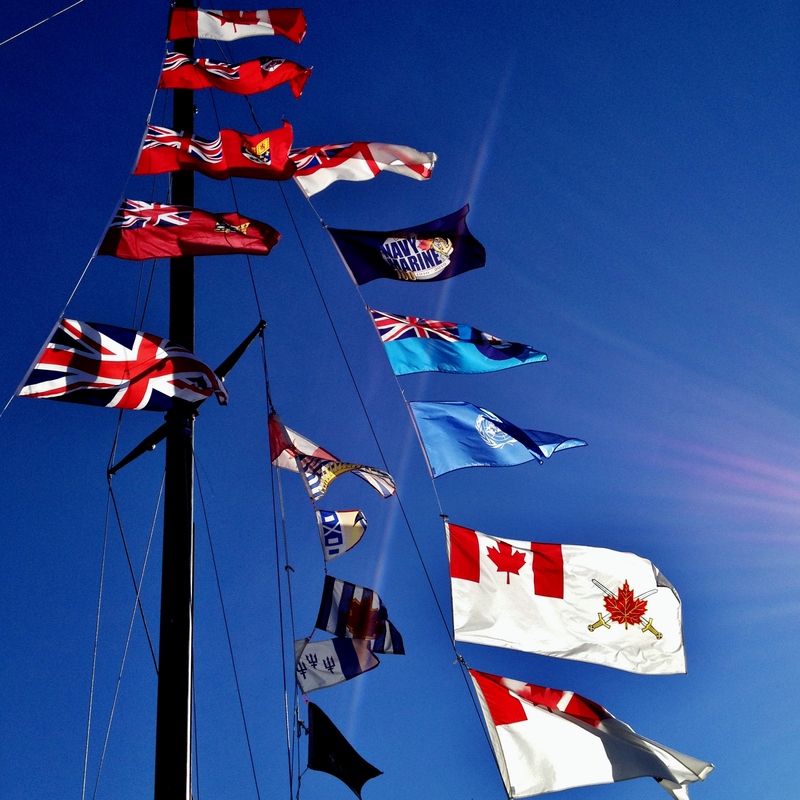 Historical war-time recordings including a Winston Churchill’s speech, bagpipes, and prayers are played over a loud speaker system setup on one of our member’s boat. Another of our members is a pilot with the Snow*Flake aerial formation team, and they flyover our gathering in the “missing man” configuration. After the ceremonies, all attendees are invited back into the covered picnic areas for a chili and hot dog lunch. Photography 101 Day 14, It’s a swarm! Show us something that overruns your scene, but observe and compose carefully before you click the shutter. Don’t just point and shoot. Observe your scene closely before pressing the shutter. Spend time watching and planning your frame, so that you can take a photo that captures a unique moment in the larger scene. More than 400 participants of all ages (many of them sporting crazy costumes and some wearing almost nothing at all) signed up for the annual New Year’s Day Penguin Plunge in Burrard Inlet under dry skies and a balmy 8ºC temperature. “It was a great day,” said event organizer Nicki Forster. Forster believes the plunge has become a huge event in the community. 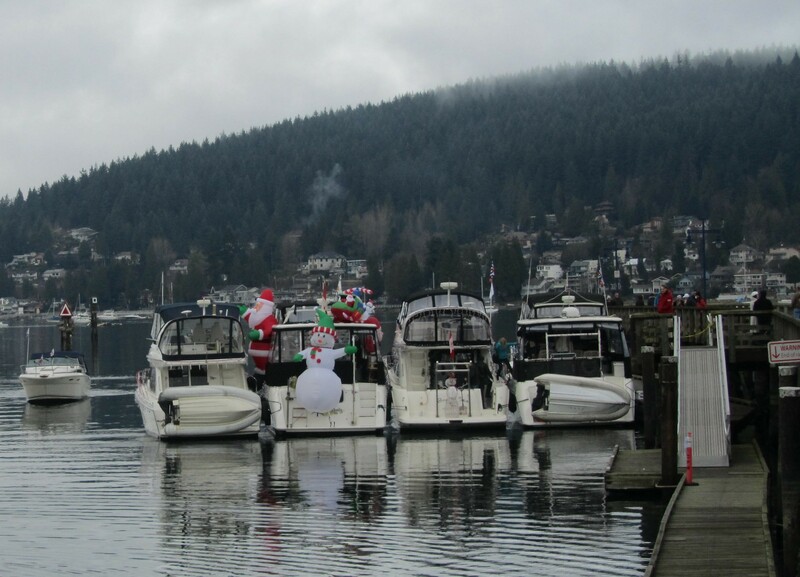 “It’s the community getting together to celebrate the start of the new year,” she said, noting it wouldn’t be possible without help from the City of Port Moody. Nancy Scott of the Pleasantside Community Association, which hosts the annual tradition off the Rocky Point Park pier, said about $1,000 was raised for the organization through registrations and refreshment sales. Pleasantside Community Association is a fundraiser for the Old Orchard Hall. 2 of our PMPSS members also took the plunge this year and jumped into the frigid waters from the 5 vessel raftup halfway down the pier. If you missed your chance to get wet, the association intends to hold another Penguin Plunge to start 2015. Photography 101 Day 11, Colors can stir emotions within us, tell stories, and transform our images. Today, use one color to add life or drama to your shot. 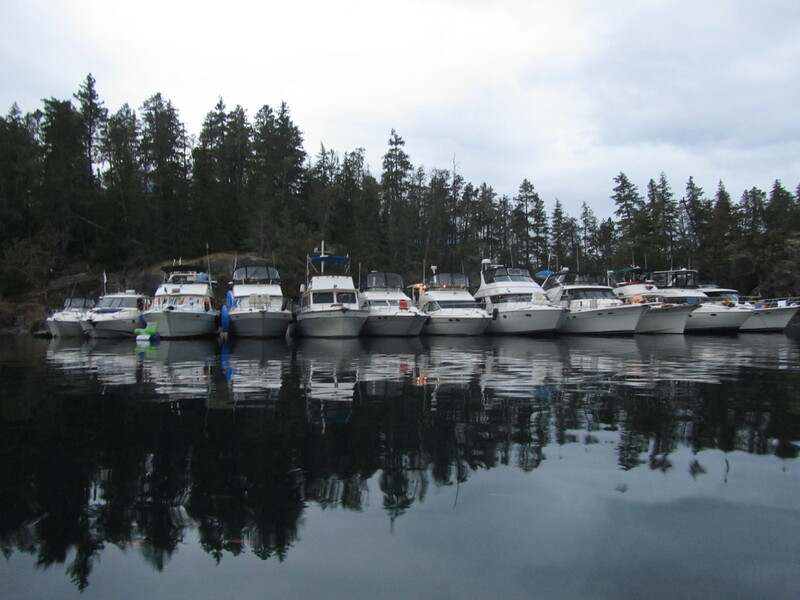 For over fifty years, the Vancouver International Boat Show has been, and still is, one of the best ways to find the latest & most innovative boating products on the market. 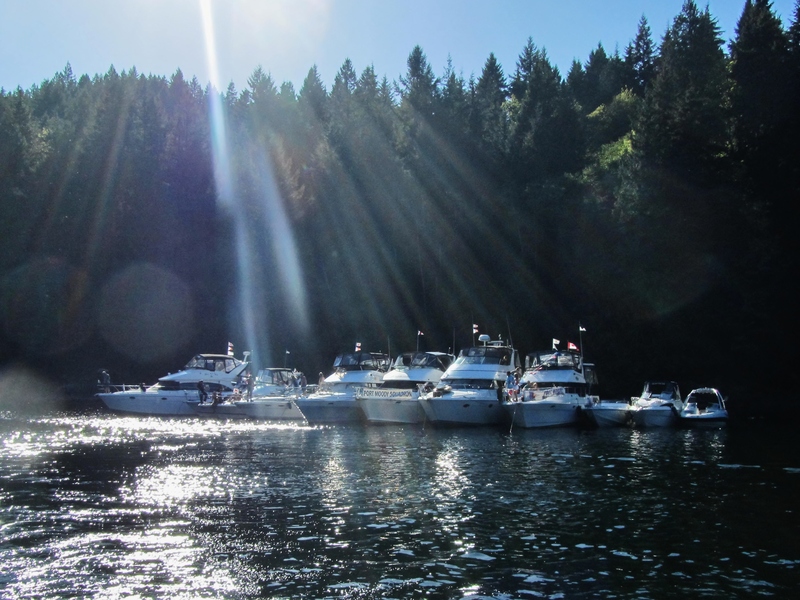 For a modest entrance fee, boaters have access to free seminars put on by boating experts including hands-on skills training, and free 30-minute power or sailboat rides to get a taste of the boating life. The Canadian Power & Sail Squadrons is there too teaching boaters about being safe on the water. Use bilge filters or bilge pads. Use environmentally friendly cleaning products & bottom paint. Dispose of all wastes properly. 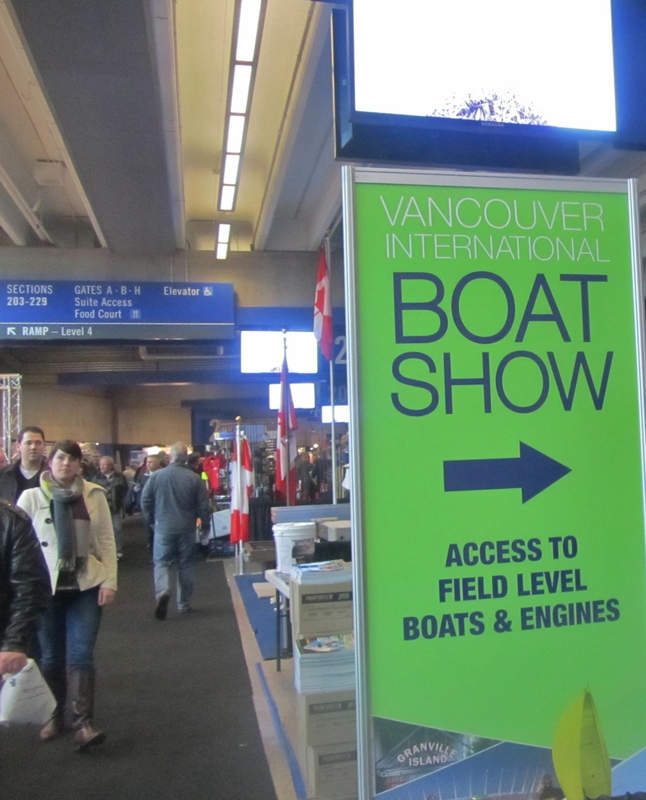 The next Vancouver International Boat Show will be held January 21-25, 2015 at BC Place Stadium and Granville Island. Our squadron has added the boat show as a cruise destination to our cruise schedule. The marina we dock at is nestled on the waterfront of the vibrant Yaletown neighborhood and is a daytime hub of activity in the southeastern part of downtown Vancouver. It’s surrounded by parks, patio restaurants, urban apartments and modern condos of residential towers with spectacular views. The Vancouver sea wall passes right along by the marina and is one of the docking places for both the Aquabus and False Creek Ferry routes to Granville Island. All the amenities of gracious urban living can be found nearby, from the gourmet markets, yoga establishments and public transit, to the busy nightlife and boutiques. Our members have a lot of fun there and I really look forward to going, and you can look forward to my report on anything to do with boats and furiends. Photography 101 Day 7, Landmarks are everywhere: iconic places, meeting points, markers on a map. Today, consider a unique point of view as you photograph a landmark. These landmarks on a map can be famous and instantly recognizable, or sometimes they’re simple markers to help us navigate. A variant of a landmark is a seamark, a structure usually built intentionally to aid boaters navigating featureless coasts. These aids to navigation are very important for keeping furiends safe on the water. They are used to indicate channels, dangerous rocks or shoals, mooring positions, areas of speed limits, traffic separation schemes, submerged shipwrecks, and for a variety of other navigational purposes. Some are made to be visible in daylight only (daymarks), and others have some combination of lights, reflectors, bells, horns, whistles and radar reflectors to make them useful at night and in conditions of reduced visibility. Marks are shown on nautical charts, using symbols that indicate their colour, shape and light characteristic, and usually have a name or number identification. In nautical terms, humans call the left side of the boat “port”, and the right side “starboard”. The colours red and green also represent the sides of the boat. Red is starboard and green is port. 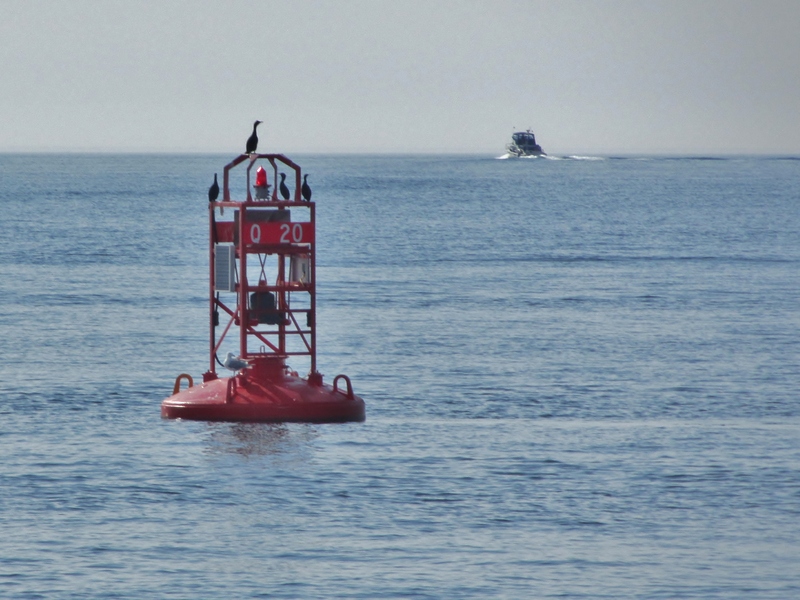 When heading upstream (against the current) in Region B, green buoys must be passed on the left side of a boat and red buoys must be kept on the right side of a boat. In Region A, it is the opposite. The Sutil Point light and bell buoy pictured here is almost a mile off shore near the extremity of the rocks and shoals that extend off the southwest end of Cortes Island. Getting up close to some of these buoys can prove interesting because many birds and other sea life like to rest or perch themselves on it. Writing 101 Day 19 Today is a free writing day. Write at least four-hundred words, and once you start typing, don’t stop. No self-editing, no trash-talking, and no second guessing: just go. Bonus points if you tackle an idea you’ve been playing with but think is too silly to post about. I really liked the Point Of View assignment back on day 9 so I thought I’d to do it again. This photo was one of my choices I had considered using for that assignment and now I’ll use it for this one. I was even playing around with the idea of making this a recurring blog feature…is that too silly? Writing 101 Day 18: Craft a story from the perspective of a twelve-year-old observing it all. For your twist, focus on specific character qualities, drawing from elements we’ve worked on in this course, like voice and dialogue. Prompt: She had seen better days, but Mrs. Pauley had been grounded there since before anyone can remember. 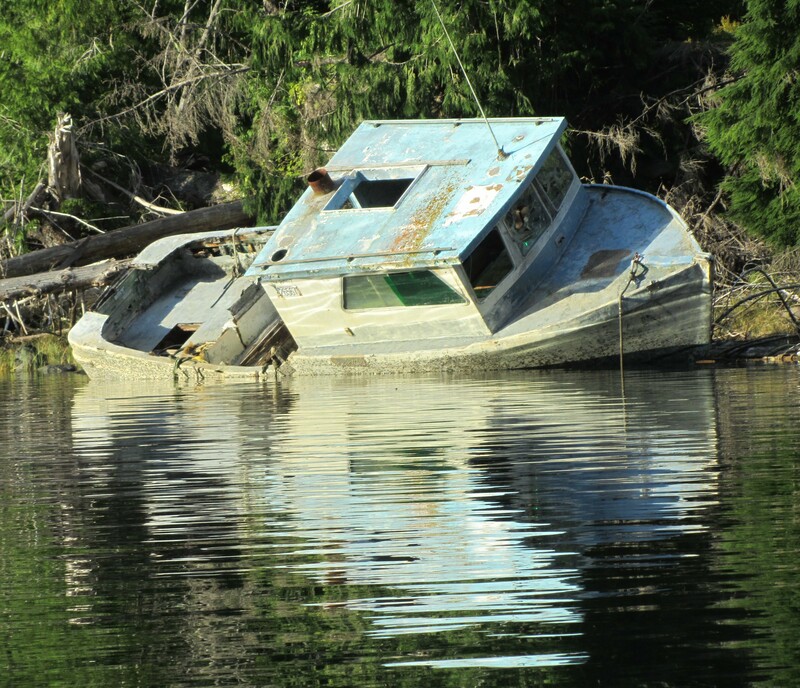 She’d fallen in disrepair and no one knew who her captain was. The Harbour Authority, accompanied by C-Tow, have come to evict Mrs. Pauley from the coast she’s served on for forty years. It had been less than 24 hours after mom lost her wallet and she had it back in her hands, intact. Standing out in front of the Superstore in Campbell River, John started telling the humans how he made the connections that led to him to finding her. John was the volunteer Nautical Days Food Booth Coordinator, and had returned to the park that morning. The locals were there too with their metal detectors…the finders of metal stuff…and it was they who turned over the wallet to John. First off he checked the wallet for any identification cards. A driver’s license revealed who she was and that she lived on the mainland. Instantly he knew it was going to be next to impossible contacting her over here. Scanning through the rest of the cards he came across her Canadian Power & Sail Squadron membership card. 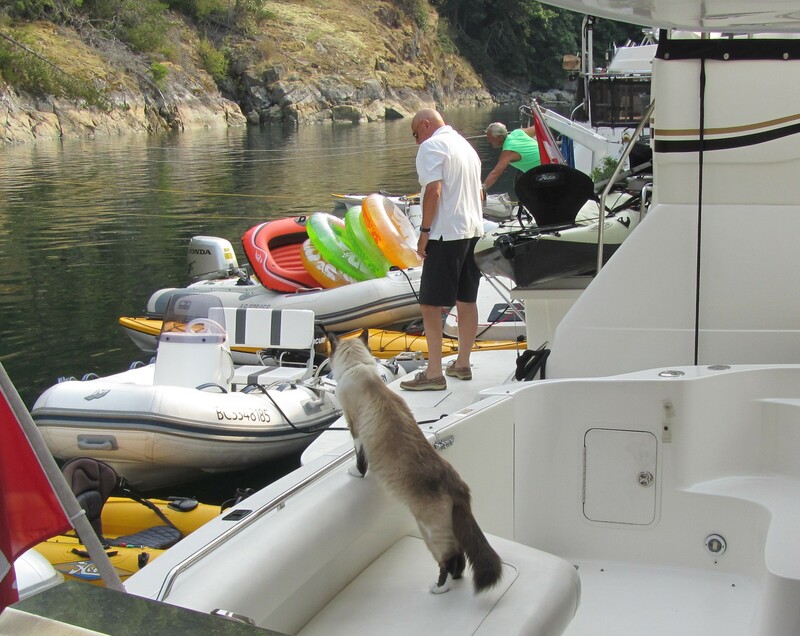 On second thought, as he looked up and surveyed the marina directly in front of him, maybe it wouldn’t be that difficult . “Of course”, he said to himself and headed towards the crisscross maze of docks.